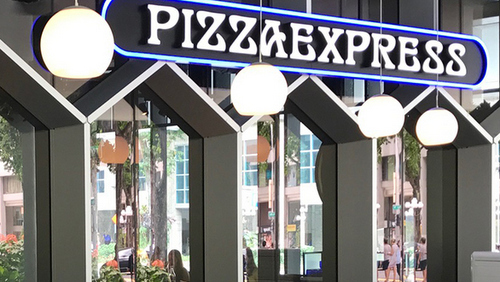 British PizzaExpress restaurant chain has five locations in Singapore, one of which is within Duo Galleria (7 Fraser Street). 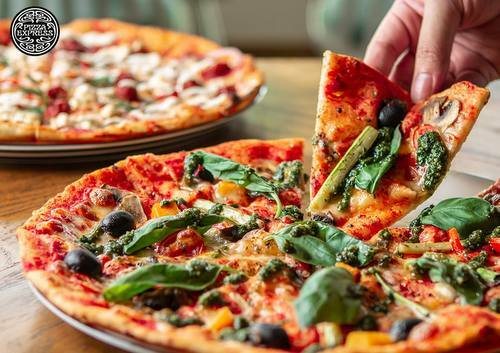 Founded by Peter Boizot in 1965 and today owned by Chinese private equity firm Hony Capital, PizzaExpress is a global pizza restaurant chain with more than 600 outlets worldwide. At each of the restaurants, you’ll discover a unique blend of delicious pizzas, inspiring art, beautiful music, and stunning interior design. The chain’s passion for Italian food can be traced back to the founder, Peter Boizot, and his love affair with Italy. Unhappy with the pizza in London, he originally shipped over a real pizza oven from Naples, knocked down a wall to squeeze it into a small restaurant, and opened the very first PizzaExpress on Wardour Street in Soho. …Laksa Romana Pizza (prawns, mussels, squid clams, quail eggs, fried beancurd (tac pok) and homemade laksa sauce), and Hawaiian ‘PizzaExpress’ Romana Pizza (ham with pineapple chutney, mozzarella, red onion, fresh basil, Parmesan and garlic oil on a creamy béchamel base, finished with fresh parsley). In addition to Classic and Romana Pizzas, you can also order starters, salads, handmade pasta dishes, traditional pasta dishes, as well as desserts. The official PizzaExpress Singapore Facebook page is available at www.facebook.com/PizzaExpressSG/. You can also follow PizzaExpress SG official Instagram account, which in turn is located at www.instagram.com/pizzaexpresssg/.